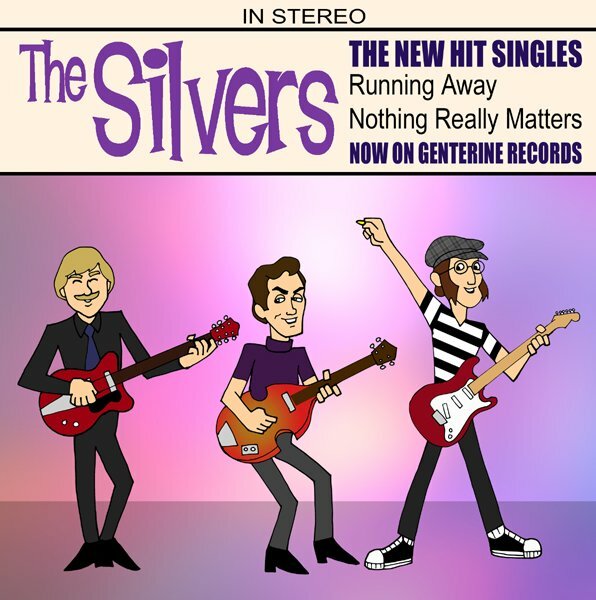 Home › Current News › Advance Notice – New Release Coming from The Silvers – Hit Singles! Advance Notice – New Release Coming from The Silvers – Hit Singles! The Silvers have been patiently waiting until the cover art was finalized for our latest single so we could release it. Ricky, Tom and I are excited as we enter into the final stages of mastering our two new hits, “Running Away” (written by Ken Wiles and Mick Orton) and “Nothing Really Matters” (written by Mick Orton and Ricky Zero) which should be ready for release around Christmas… we hope! Ricky’s friend, Bambi Lynn, designed the cover with a little input from the three of us, and I think it is great! It will go along perfectly with the video we are planning to do to accompany the release of the CD. We are also contemplating a vinyl version but only if the demand is strong enough from you guys. Once the single is completed, we will be moving on to finishing the rest of the tracks for our first album. So here it is! A sneak peek of some new music coming your way soon from this Silver Laughter offshoot!